For times you need to place your computer in a different room or rack, NTI sells high-grade extension cables that allow you to put some serious distance between the computer and keyboard, video and mouse (KVM). Many stations prefer to rack mount their computers OUTSIDE the studio to keep things quiet. You can purchase through WireReady or direct thru NTI. 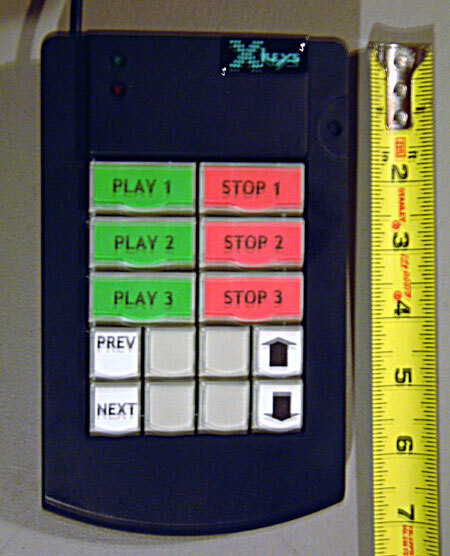 NTI also makes a virtually unlimited variety of active KVM switch boxes including the ability to see and control more than computer/studio from the same keyboard/mouse/video position, to the ability to have multiple positions for the same computer and they offer switches using conventional cabling, or IP/ethernet solutions. Note: It is one integrated cable with the ends pre-molded onto the ends. You should not cut these cables - if you cannot run cables point to point with the ends already on them - do not buy these cables. If you are using USB based keyboards or mice, you cannot use these cables. We sell our own line of certified USB to COM converters when you need RS-232 ports and don't have them. They are self powered. They are $25 each. One or more of these can be installed. When using more than one, purchase a standard USB 2.0 hub. You can also put one adapter per USB port without a hub. We have found some store bought brands are flakey so we recommend you purchase ours. We also recommend these if you need several com ports on the same computer. They are substantially less expensive than PCI based cards. Any programmable in-line keyboard works great with WireReady software. We recommend and resell the XKEYS.COM mini in-line keypad. They offer a PS2 and a USB model. The unit costs $129.95 unprogrammed/unlabelled direct from the company, or for $179.95 we'll sell you one pre-programmed, tested and pre-labelled as shown in the picture. For news use, we provide 3 separate starts and stops (for stations who are using 3 sound cards/faders on their console) but it is ideal even for stations just using one sound card. The up and down arrows provide a simple ability to scroll the on-screen newscasts if you aren't reading on paper, and with this mini pad you need not use the keyboard or mouse while on the air. The keypads have lots of extra keys despite their small size and stations can easily create other macro keys to do ANYTHING they want in our application. Keep in mind, one button on the keypad can be programmed with MULTIPLE keystrokes so they are macro keys not just key substitutions. The PS2 model has its own memory and you program it by putting it into a record mode - watching the keyboard it's connected in line with. The USB model uses a software driver and you keep the macros programmed via their included software. Note: USB purchasers get a template file from us so they don't have to manually key in all the keys equivalents. The PS2 model comes ready for immediate use pre-programmed.